Supporters cheer as a runner crosses the finish line at the 5K to benefit Josie Nordman, a Communication sophomore with cystic fibrosis. Her fund recently reached $50,000 in donations. After almost three months of fundraising, Communication sophomore Josie Nordman’s lung transplant fund has reached about $50,000. 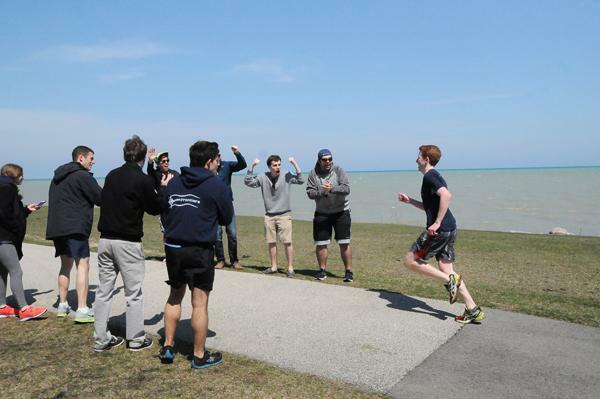 Northwestern students added their latest donation Sunday with a 5K run at the Lakefill. The NU community has rallied behind Nordman, who suffers from cystic fibrosis. Her worsening condition left her with just 16 percent lung function as she waits for transplant lungs to become available. Nordman and her family will have to pay up to $75,000 of the $750,000 procedure. About 70 people ran in the 5K, which raised about $350. Josie Nordman and her mother came out for the event, which was sponsored by the Phi Delta Theta and Delta Gamma fraternities. The fund is only $25,000 away from covering the family’s maximum cost of Josie Nordman’s life-saving double lung transplant, which she said could happen at any time. Nordman was moved up the transplant list last month, and her mother said that Josie will likely receive the next available lungs that match her height and blood type. Though her condition is declining, Josie Nordman is still in Evanston and not at home in Homewood, Ill., which is about an hour away. She takes classes two days a week, produces a play set to open in late May and remains active in Chi Omega sorority. A member of the NU Equestrian Team, Josie Nordman recently rode her horse Loki for the first time in months — he carried her oxygen on his saddle. But walking and breathing are still difficult, and she has to wear oxygen full time. The procedure typically requires about three months of home recovery. Remaining healthy in the first year is crucial. The transplant will only cure Josie Nordman’s lungs, but she said it will allow her to return to performing, singing and riding. She hopes to be back on her horse six months after surgery. More than 30 student groups have planned fundraisers during Winter and Spring quarters. Her Indiegogo online fundraising account has $43,398, and additional donations are in the Josie Nordman Lung Transplant Fund. Nicolle Nordman said NU support has not dwindled since students first heard of her daughter’s transplant in January. Moss, a Communication senior, met Josie Nordman when they worked together on student productions. His mother’s friend is one of the oldest living people with cystic fibrosis, and he was able to connect her with Josie Nordman. He also coordinated the Bros Belting Ballads event April 1, when students packed Jones Residential College and spoofed dramatic songs. The two events together have contributed about $1,150 to Nordman’s fund. Moss is already thinking about his next event and said if needed, he will continue helping after he graduates next year. Nicolle and Josie Nordman agreed the support from the NU community has been indispensable. Nicolle Nordman repeatedly said her daughter could not be here without all the help she has received. NU’s Fiedler Hillel Center has driven her to class, and her friends continue to help with anything she needs.